doing acupunctureAcupuncture is the practice of using needles inserted in the body to treat illness. According to one acupuncturist: "These must be the oldest and most extensively used medical devices in history." 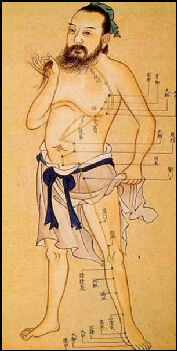 Acupuncture was reportedly invented in 2,700 B.C. to the legendary Shen Nung, who also put together the first known book of herbal medicine. Acupuncture is a very common treatment option around the world. Based on data from a 2007 study, nearly three million adults and 150,000 children use it. Currently, China has about 600,000 licensed doctors in traditional Chinese medicine and almost all are trained in acupuncture, official statistics show. In Beijing, a single session of acupuncture therapy costs 4 yuan ($0.59), a price set 20 years ago. As a result of the low price acupuncturists don’t earn much money. "That hurts the enthusiasm of practitioners and many acupuncture students at my school change occupation after graduation," Li Zhigang, deputy director of the acupuncture school of Beijing University of Chinese Medicine told the China Daily. The main purpose of acupuncture is to stimulate the flow of the life force qi (see Below) that moves through 14 mysterious energy meridians ("energy channels") in the body. Neither qi or meridians have been proven to exist. Acupuncture needles vary in length (half inch to three inches) and diameter. The most commonly used needles are as thin as hairs and are one or two inches long. 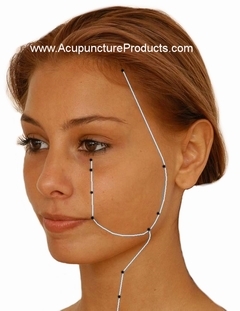 Most have a thickened handle that the acupuncturist twists between thumb and forefinger to stimulate the acupuncture point after piercing the skin. In the past acupuncture needles were made of bamboo gold, silver, copper or tin, but today they are mostly made from stainless steel. Sometimes the needles are hooked up to wires running from a flashlight battery to give the patient a little buzz. Acupuncture is often used in conjunction with herbal folk remedies and Western medicine. There are many hospitals and clinics in that offer acupuncture and many of them teach acupuncture and herbal medicine. In addition to acupuncture, acupuncturists perform accupressure and read energy lines. Many acupuncturists in Asia are blind because many people there believe the blind have a more sensitive sense of touch than sighted people. They generally receive their training at special schools for the blind. Blind people often have few job options other than being an acupuncturist or a masseuse. Internationally, traditional Chinese medicine, acupuncture in particular, has been officially recognized and is widely practiced in countries like Japan, the United States, Germany and Republic of Korea (ROK), experts said. Countries like ROK, Japan and France used to claim they were the cradle of acupuncture, according to Huang. Li Zhigang, deputy director of the acupuncture school of Beijing University of Chinese Medicine, told China Daily that ROK had tried to file an application for acupuncture to UNESCO. "If they had made it before China and succeeded, people in other parts of the world might think it was South Korea that created acupuncture," he said. 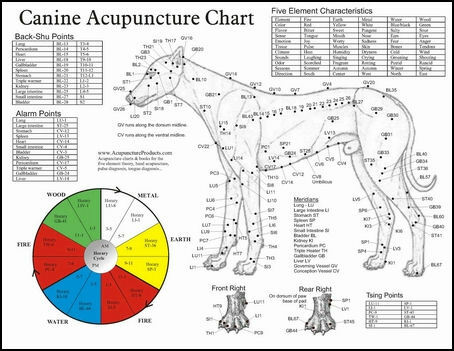 Acupuncture meridians Some 2,000 needle insertion points have been identified although only about 150 are commonly used. The points on the skin where needles are inserted often correspond to organs and parts of the body that are some distance away. Sometimes a problem in the liver, for example, might be treated with an acupuncture needle to the wrist or back pain might be treated with needles placed behind the knees and heels. The meridian that affects the lungs runs from the right shoulder to the right thumb. The meridian used to treat the heart goes from the right armpit to the right pinkie. The meridian affecting the spleen runs from the left calf area to the left arm pit. The meridian influencing the kidney goes from the collarbone below the neck to the upper thighs. Alcohol abuse is treated with points on the wrists and right ear; nausea is treated with points on the knees and chest; asthma is treated with points on the knees, wrists, face and upper chest. Painful menstruation is treated with points on the ankles and abdomen. One acupuncturist told the Washington Post that acupuncture "works very well" for nausea. "It's an easy one, because it's an imbalance in the system. Nausea is an energy of the body going in the wrong direction. Your stomach energy should go down. But sometimes it goes up. So you get nauseous." Acupuncture points tend to correspond to areas where connective tissues are the thickest. One doctor told Newsweek, “Connective tissue forms a web that goes through the body. A study using FMRI (functional magnetic resonance imaging) found the meridian points associated with eyes problems did in fact simulate the visual cortex and that needle points in the foot stimulated areas in the brain associated with pain. In China acupuncture has been used instead of anesthesia on fully-awake open-eyed patients undergoing open heart surgery, major lung operations and other kinds major surgery. In a dramatic case Bill Moyers, the TV personality, talked with a woman that was anesthetized by acupuncture while a doctor was removing a tumor from her brain. The journalist Audrey Topping said she nearly passed out when she observed open heart surgery being done on a fully conscious patient during a demonstration of acupuncture. The patient however smiled at observers and drank orange juice while the surgeon cupped her heart in his hand. Topping also saw a 54 year-old woman have a tumor removed from her throat. 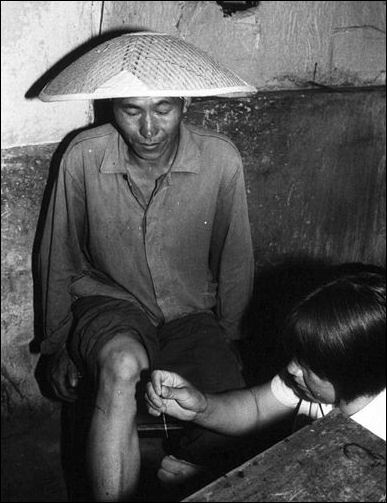 During the operation the doctor would occasionally twist the acupuncture needles. When the operation was over and the incision in her throat was stitched up, the woman got up and ate a mandarin orange, thanked the doctor, waved to observers and walked out. Topping said she wasn't even pale. An acupuncture doctor in Seoul said, "the effectiveness of acupuncture in anesthesia depends so much on the patient, on his constitution and on his psychological state that surgeons simply do not have the time to consider all this when other methods are very efficient." One of the main benefits of acupuncture is that is has few side effects. It considered useful in treating things like migraine headaches in which conventional medications often have unpleasant side effects. acupunctureproducts.com Acupuncture is used mainly for the relief of pain and the treatment of chronic diseases, arthritis, post-surgery nausea, migraines, fatigue, tension headaches, shoulder pain, ankle sprains, whiplash, tendinitis, osteoarthritis of the knees, digestive disorders, urinary and bowel disorders, asthma, sinusitis, sports injuries, allergies, and menstrual cramps and irregularities. The Chinese at one time claimed have cured deafness with acupuncture. The World Health Organization recognizes the use of acupuncture for constipation, diarrhea. bronchitis, facial tics and tennis elbow. In the West many people begin using acupuncture after not responding well to conventional Western treatment and seems to be most affective treating people with chronic pain. Acupuncture has been used in the Unites States as a treatment for pain, substance abuse, nausea and vomiting, asthma and other respiratory ailments, stoke and paralysis. Most Americans who undergo acupuncture treatment do so for lower back pain. In the Bronx a large number of recovering drug addicts were treated daily for three months with acupuncture needles in their ears. One substance abuse official said, "I was astonished at the results...tremendously better than any residential treatment program could imagine attaining" at a cost of less than $1,000 a person. In a Miami substance abuse acupuncture program, 78 percent of the patients went two years without getting rearrested, compared to 15 to 20 percent in standard drug programs." In Montgomery County, Maryland in the United States, drug addicts are treated with five needles pinched into each ear, followed by relaxing and sleeping with New Age music playing in the background . Similar programs are offering in several other locations in the United States. In Miami-Dade County, Florida, 85 percent of people in addiction treatment programs use acupuncture. Thus far that is little hard evidence to prove the treatments work but anecdotally many say the treatments help patients relax, sleep better, and get along with others and thus make them more receptive to therapy and have less cravings for drugs and alcohol. In one Chinese study, 611 heroin addicts given acupuncture had a 80 percent relapse rate after nine months, compared to near 100 percent for most Chinese addicts. Addicts in the United States say the acupuncture treatments to their ears makes them feel relaxed and lowers their craving for drugs. One doctor told U.S. News and World Report, “The person feels more comfortable, more able to listen and cope." In China, acupuncture is being used by vets to treat dogs and other animals of ailments such as paralysis, skin disease and tumors. Reuters described a treatment used on a dog in Hong Kong that had been unable to walk since a spinal injury and was able to standup after acupuncture treatments on his back and lifeless legs. acupunctureproducts.com There is little evidence to prove that acupuncture cures serious ailments like heart disease and cancer, but does seem to be a very affective treatment for chronic back pain, migraine headaches and arthritis. One survey found that 66 percent of Chinese doctors use acupuncture to treat the affects of strokes, with 63 percent of them saying it is effective. A study conducted in China with 1,208 stroke victims, found that patients given acupuncture within 30 days of the stroke were significantly less likely to became invalids than those who given no treatment or a sham treatment. One study has shows the acupuncture provides pain relief and improved functioning for people with osteoarthritis. Twice weekly acupuncture sessions in a study at the University of Maryland reduced pain and increased walking ability in eight of twelve patients who suffered from chronic joint inflammation. In a Swedish study, 78 paralyzed stroke victims treated with acupuncture made more significant improvements in mobility, balance and quality of life than those who didn't receive acupuncture treatment. Studies have shown dramatic improvements with chronic migraine sufferers. Critics have criticized the methodology of many of these studies. Owen Wilson a professor of medicine at Baylor College wrote: "In the clinical literature, for virtually ever study with a positive outcome, one ca find one with a negative result. Many of these studies are poorly designed, do not incorporate proper controls." Canadian researchers from the University of Alberta in Edmonton reviewed decades’ worth of data that evaluated problems associated with needle acupuncture in children and found that of 279 adverse effects they identified, 25 were serious, one was moderate and 253 were mild. Serious adverse effects included infections, intestinal blockages and one case of a fatal rupture of the heart. Mild outcomes included pain, bruising, bleeding and a worsening of symptoms. “Based on the literature, its most often used in pediatric patients with chronic pain, asthma, eczema and allergies,” said Dr. Lawrence Taw, assistant clinical professor at the UCLA Center for East-West Medicine in Los Angeles. Taw was not involved with the Canadian study. “It’s considered very safe, but must be done by a practitioner who is well-trained and experienced. The most important thing is to know the anatomy very well---needles in certain areas of the body are potentially more dangerous,” he said. Children may also have difficulty following directions or may be uncomfortable with needles, which can present safety concerns since they should remain relatively still while the needles are in their body, Taw explained. Describing the acupuncture treatment of a 16 year old girl with a rare hormonal disease that causes muscle spasms and crippling joint inflammation, Weiss wrote:. "After years of getting bounced from one doctor to another she was referred to Xia Ming, a medical doctor and acupuncturist. Ming knew from looking at her fingernails she had hormonal problems." Describing the treatment Weiss wrote: "Ming leans over his young patient and feels her back with his finger while swabbing his target areas with an alcohol pad. Then with a speed that belies the accuracy of his aim, he stabs a thin disposable, four-inch needle sharply into the skin below the girls's left shoulder blade, pushes it in about a half an inch and deftly twists it clockwise and counterclockwise for a few seconds." "In quick succession, Ming fixes two needles into her lower back, two others into the backs of her calves and two into her ankles, again twisting them. 'Feel that,' he asks. He knows he's in the right place if, when he twists each needle, his patient gets a deep sense of numbness or heaviness in the area." The patient described the treatment as "a series of stings and tingling-sensations with an occasional electrical buzz, just short of real pain. She said that the pain from her disease has been reduced since she started the treatment. "Ming informed me that although I was in good general health, I was weak from too much stress. He would give me a general "tuneup," stimulating several different points that would help me regain biological and spiritual balance." "I lay down on the examining table, and Ming dabbed alcohol on my arms and legs. He took a thin needle from the box nearby. I closed my eyes and tensed. Then with a tap of his finger, he drove the tiny spear into the skin of my right calf. Not only did it not "really hurt." I barely felt it. The tiniest zing, but definitely not pain." "The same was true with six other needles, inserted in quick succession in various parts of my arms, hands and legs. Zing. Zing. Zing. Then came the real test. Acupuncturists must twist each needle...until triggering a deep throbbing sensation, which is the signal that the needle is in the right place. For me these sensations were mostly mild, almost pleasant, like the feeling of a muscle that's sore from exercise. But when Ming twisted the needle in the web of flesh between my thumb and index finger, I felt an uncomfortable twinge that made me shiver. And when he rotated the last needle---one imbedded deep in my arm just above the elbow---Whoa! A shock wave of intense pain went up and down my arm." "Did I feel better? Its hard to say, especially since I wasn't feeling out of sorts to begin with. Most noticeable, the session left me feeling unusually relaxed...But I had to wonder whether a 20-minute rest in a darkened room without needles might have done as much." Patients being treated with acupuncture often experience physiological changes such as alterations in blood pressure, changes in the electrical activity in the brain and changes and increased blood flow in the thalamus, a part of the brain that processes nerve impulses for pain, temperature and touch. Although there is no clear consensus on exactly how acupuncture works, most doctors and researchers agree that acupuncture does not work through some magical or spiritual process. Rather, they believe it works by stimulating the release of transmitter chemicals such as endorphins and monoamines that inhibit pain signals by blocking their path through the spinal cord. It also releases ACTH (adrenocorticotropic hormone), a chemical that aids in fighting inflammation; prostaglandin, substances that believed to help wounds heal faster; and other substances that induce nerve regeneration. Doctors believe that an acupuncture needle stimulates the sensory nerves near the point where the needle is placed. The nerves send electrical impulses to the spinal chord which cause the nerve cells to release endorphins, opium-like painkilling chemicals that block pain messages from reaching the brain. Impulses are also believed to reach the midbrain, releasing neurotransmitters that block pain pathways, and the pituitary gland, which directs to endorphins, anti-inflammatory chemicals into the brain and bloodstream. Experiments at the University of Toronto have shown that acupuncture stimulates the production of endorphins and increases the brain chemical serotonin. Research has shown that different levels of electricity stimulate different natural opiates in the body. When needles are twirled slowly, simulating low-frequency electricity, endorphins and enkephalins are released. When needles are twisted more quickly, simulating high-frequency electricity, other kinds of opiates are released. In June 2010, a team of U.S. neuroscientists led by Maiken Nedergaard of the University of Rochester Medical Center reported that acupuncture works by releasing a natural molecule called adenosine. The researchers gave mice a inflamation-inducing chemical and inserted needle at points in the mice’s bodies and found levels of adenosine surged around he needle insertion points by as much as 24-fold. The discomfort of the mice---as measured by the rodents’ response time to touch and heat---was reduced by two thirds. The most serious harm from acupuncture comes from using dirty needles. Skilled acupuncturist either sterilize their needles or use disposable one. Patients that are worried about contacting disease from dirty needles should bring their own needles. There have never been any fatalities attributed to acupuncture, but a few people have gotten hepatitis B from reused needles and there have been eight cases of punctured lungs in the U.S. from needles inserted to deep in the chest. There is also a danger of contacted the AIDS virus through exposure to contaminated needles. Critics point out the use of acupuncture to treat pain of unknown origin may be harmful because it could delay seeking a correct diagnosis of the source of the pain with serious and sometimes fatal consequences. Many doctors have attributed the success of acupuncture to hypnosis or the placebo effect. One doctor who visited China said the patients he met he saw who were give acupuncture were screened for suggestibility and susceptibility to hypnosis. Experts who want to study acupuncture plan to administer acupuncture to one group of patients and stab another group with needles in random locations to see if the results are the same. 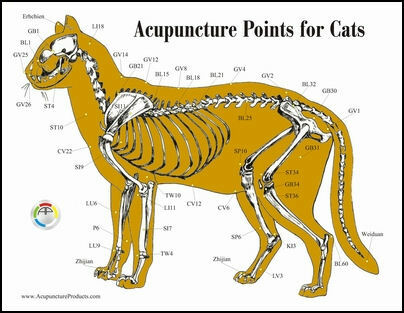 Acupuncture has been used successfully on animals. Physicians attending a conference on acupuncture in 1996 were shown slides of cows undergoing surgery with acupuncture instead of anesthesia. The fact that acupuncture works on animals that can not be hypnotized is offered as evidence that it doesn't work by hypnosis. A study by John Longhurst at the University of California at Irvine showedthat acupuncture does help lower blood pressure in cats. Needles were placed on the traditional meridian for heart and blood vessel and given tiny pulses of electricity, stimulating the brain to produce endorphins and enkephalins, which helped reduce blood pressure artificially elevated with drugs. Bruce Pomeranz from the University of Toronto told U.S. News and World Report, "There is overwhelming evidence from animal studies that acupuncture reduces pain by triggering the release of endorphins and other substances by the nervous system." Owen Wilson, medical professor from Baylor College, wrote, "It seems difficult to refute the argument that neural conduction, not the flow of an unidentified [qi], is responsible for transmitting acupuncture information. No good evidence for the existence of special structures corresponding to accupoints or meridians has been found." Many people first learned about acupuncture when New York Times reporter James Reston described his experience being treated with acupuncture to relieve postoperative pain after an emergency appendectomy in China in 1971. In the early 1970s, American physicians who used acupuncture did so in secret. If they were caught using it there was danger their medical license might be revoked. In 1979, the World Health Organization concluded that: "The sheer weight of evidence demands that acupuncture be taken seriously as a clinical procedure of considerable value." In 1993, the U.S. Food and Drug Administration (FDA) estimated that there were between 9 and 12 million "patient visits" to acupuncturist in the U.S. and Americans spent $500 million on acupuncture treatments. 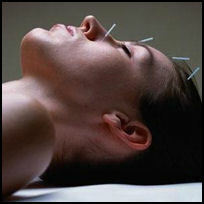 In 1995 the FDA classified acupuncture needles as medical devises for "general use" by trained professionals. The director of the FDA said, "There is some suggestion that acupuncture works for...specific claims but it doesn't reach the level of proof we generally require. In the 1990s, acupuncturists listed in the phonebook; more than 20 acupuncture schools have been accredited by the U.S. Department of Education; and about 10,000 acupuncturists and 3,000 physicians are licensed to practice acupuncture.